Thankfully toddlers are not art critics. They take joy in simple pleasures and aren’t going to worry if your arts and crafts skills aren’t going to get you a gallery listing. Marker pen or felt tips (or buttons or googly eyes). Cut your paper tube to size (toilet rolls are a good size but a paper towel roll will need cutting in half or thirds). Make eyes. The simplest option is to draw then on but googly eyes are great if you have a packet lying around. Make 4 holes on each side of the paper tube (roughly parallel). Push 4 pipe cleaners through the parallel holes so they stick out each side. You now have 8 legs! 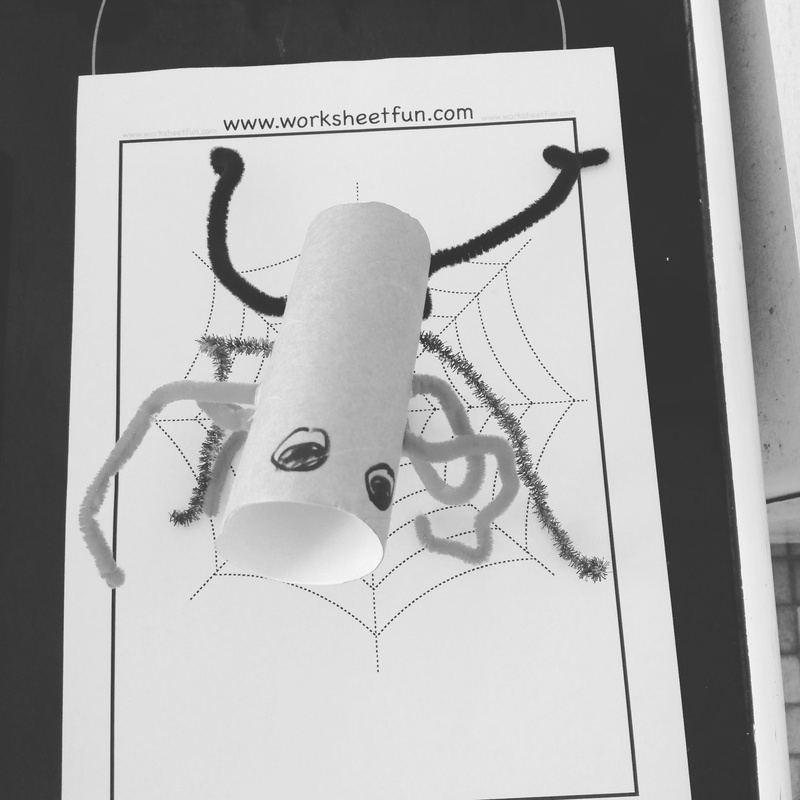 Draw a web for your spider or print one out from Worksheet Fun. I used a 150g blend that was cashew nuts (51%), almonds (26%), brazil nuts (11%), hazel nuts (6%), macadamia nuts (6%). Oil (I use Rice Bran oil). Allergies: soy free, dairy free, gluten free, egg free, peanut free. I posted recently about how easy it is to make peanut butter and wanted to try my hand with tree nuts. Making your own nut butter can be great if you have a food allergy in your family. It’s handy because you can customize it and experiment with different nuts. It can also be a cost effective way of making nut butter. Often tree nut butters are really expensive but if you’re able to pick up the nuts cheaply then it’s quick to make your own! Roasting gives the nut butter more flavour. You can choose whether you want to buy roasted nuts or roast them yourself (if purchasing pre-roasted, check the type of oil that has been used if you have a soy allergy). Roasting gives the peanut butter more flavour and helps to loosen the oils inside the nuts to blend into a smoother butter. Heat the oven to 180’C / 350’F and toast the nuts till they are golden and glossy with oil. This will take about 10 mins. Put nuts, a pinch of salt, and a teaspoon of oil into a food processor. Blend on 10-20 second bursts and scrape down the sides with a plastic spatula as needed. You’ll find it starts off looking a bit like crumbly breadcrumbs – this is normal! I found the tree nuts were a lot tougher than the peanuts and took longer to blend. You don’t want to overheat the motor on your food processor so be kind to it and aim for short bursts on/off! Continue blending until shiny and smooth. Add a teaspoon of oil at a time if you’re finding it dry. I use around 450g per batch. 1 small red sweet onion, finely diced. I have used brown onion as well for more of a hashbrown flavour. Oil (or butter) for frying. Toppings: sour cream & apple sauce. Allergies: soy free, dairy free, gluten free, peanut free, tree nut free. A food processor is great for this! I have also hand grated. In some countries you can buy bags of frozen pre-shredded potato. Note: if using a food processor for the potato then you can also use it for the onion but remove the potato first. Squeeze the potato with your hands to remove excess moisture and then pat dry. Put the potato in a mixing bowl and add onion, eggs, seasonings, and flour. Mixture should be thick and cohesive. Heat and oil a frying pan and fry batches of potato mix (I use about 2T for each patty). Fry for several minutes on each side. Drain on paper towels and serve immediately or keep warm in the oven on an oven tray lined with baking paper. If you want to wait and have everyone eat together then you can brown each side of the latkes on a higher temperature, cook for a slightly shorter time, and then finish them all off in the oven for 5-10 mins. Funnily enough, when reading our one Dora the Explorer book, Miss 2 can count 1-5 in Spanish but in English will normally jump to her favourite numbers (7,8,9). One of our recent craft activities was creating ‘Counting to 5 in Five Languages’ (English, Maori, Mandarin, Spanish, and French) but we ended up adding Croation as well as one of the families we play with regularly are bi-lingual. Miss 2 chose the buttons with some guidance from me to encourage a mix of sizes and colours. Then I hot glued on the buttons and we’ve hung it on the fridge. I try to count in different languages but it’s nice to have a reminder on the fridge and the buttons are a nice visual for her. Yay, FlyingSolo is now on Pinterest and lovingly curated to make things easy to find. Posts have been saved across multiple boards so that it’s easy to find things to do on rainy days, or things to cook for dinner, or baking, or gluten free recipes, or dairy free recipes etc. Toddlers love becoming independent and however they phrase it, what they’re thinking is along the lines of ‘Me do! Me do!’. At meal times, Miss 2 is understands that when she’s finished she needs to wipe her face and hands with a wet bamboo cloth (although sometimes she’d rather I chase her giggling into the lounge). I’m also teaching her to wash her hands before meals and that hands get washed after using the toilet (not that she has shown the remotest interest in potty training). She already thinks washing hands is a fun activity because it means playing with water (and poking at the taps, the plug hole, and trying to splash water on the floor) but drying hands is still very parent-led. I thought I would make the idea more attractive by making Miss 2 her own hanging hand towel and putting it right where she can reach it. The first step was putting up some no-damage removeable hooks in the bathroom. The next step was looking for some towels that would hang easily. The problem is that most towels aren’t designed to hang easily (especially not off little hooks) and with a toddler in tow and limited budget, I don’t have the luxury of searching through stores. The solution, therefore, was to make my own! I found some gorgeous large-sized adult face cloths at Kmart in attractive eye-catching colours. I found some ribbon in the craft box and selected some large buttons from my Bag-of-Buttons. The trick is to cross over the ends of the ribbon, place the button on top, and then sew through cloth-ribbon-button. Make sure that everything is nice and sturdily attached. It’s a cheap way to make something practical, eye-catching, unique, and still washable! Plus toddlers love little accent features (like buttons, ribbons, applique etc.). To make a 750g loaf. This was a sweeter denser bread that toasted well. It was delicious with butter & jam, and also with vegemite & avocado.